[Updated] Last chance to get your TS-5: The purchase stage of the American Challenge has been extended to 17 April, 2019 (9:00 UTC+8)! 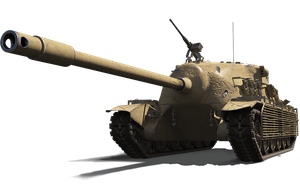 The TS-5 is the first-ever American Tier VIII Premium tank destroyer. And it is the prize tank for completing the missions from the American Challenge. Finishing more stages in the Challenge will grant you a higher discount should you wish to purchase this vehicle. Find out more about the vehicle below or click "purchase now" to go to the Premium Shop. Important Note: Purchasing the bundle gives you the full pack of rewards for the missions not completed and automatically checks all unfinished event battle missions as completed. After purchasing the bundle, you will no longer have access to them. Moves slowly for a tank destroyer. Have allies support you while ambushing enemies to avoid getting hit on weaker sides. Low mobility and gun traverse. Be sure to factor in time to angle your gun for attacking. Click on the button below to go to the Premium Shop. Remember to log in on the Premium Shop to see all items on sale!